Only 51 miles so far but tires were so easy to mount and the ride is great! Very pleased so far. This is my second set of Vlaanderen tubulars and they are fast becoming my favorite tire ! Extremely supple with a buttery ride . The measured circumference is exact when mounted at 27 mm . I might add that the quality and finish at Veloflex is absolutely second to none . Do yourself a favor and get onto this product as soon as possible but please leave a few for me ! Reminds me of the best hand made cotton and silk tires from the '80s, amazing 300 TPiI thread count and the 27mm cross section looks to add all the suppleness I could want! I received a box of five Veloflex Vlaanderen tubs to my door in the States within days of ordering. Once those tires were released from the burden of that box, the aroma of Italian made cotton tubulars was overwhelmingly inviting. There is nothing bicycle related that tickles the olfactory senses more than a handmade tub. Once glued to a pair of Nemesis cobble bombers, they were true and round. I would have been disappointed if the ride was not sublime. If you are searching for a visceral connection to the sport of cycling, look no further that considering a pair of Vlaanderens. No other tire will possess the dialectic of speed and comfort, including the current 32c-38c wired-ons currently in vogue. 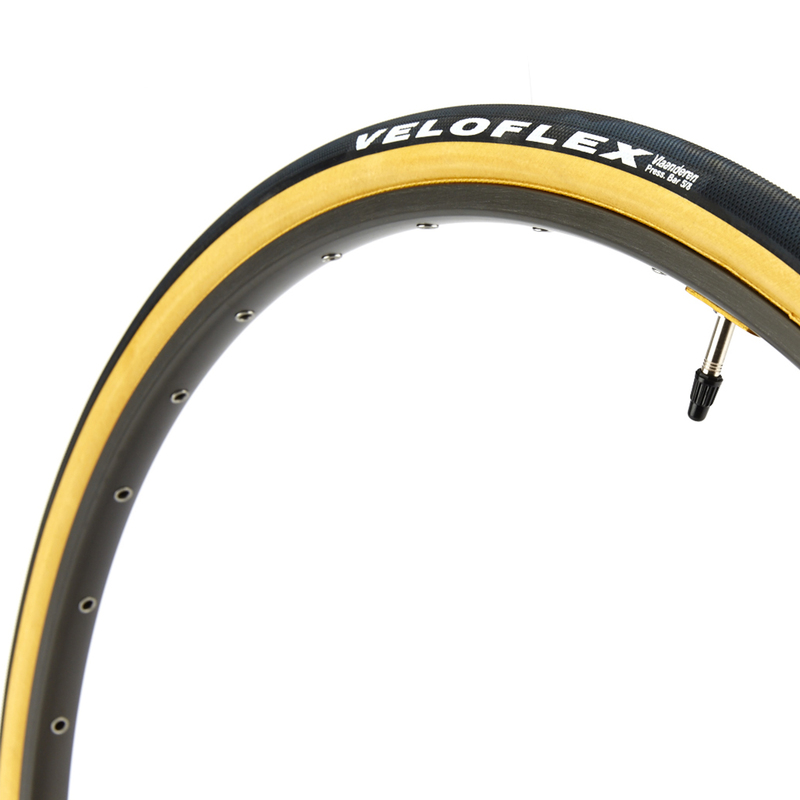 I have had very good results with all the veloflex tubular tires (sewups). This are a little wider and have just glued them up... I am expecting the same great performance as the others I have ridden. Its my first time riding these tires in 27mm and so far I am pleased as they five you a nice soft ride. I set them to 75 psi back and 65 front and they`re perfect for me at that pressure; I weigh 170 with 20 pounds to lose so I may lower the pressure a bit more later on. This is a very nice, soft tire. I was looking for a wider tire for one of my steel bikes and this one fit the bill especially with the gumwalls for that nice classic look. I just ordered one more!